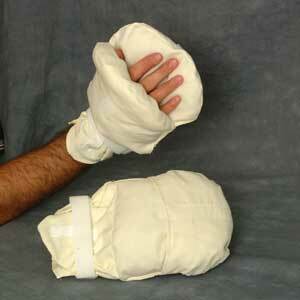 Vinyl Elbow Splint easily attaches using hook and loop straps. 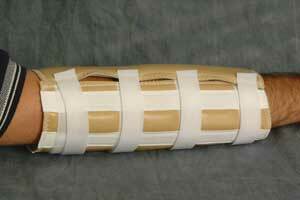 The elbow splint uses metal stays to prevent bending of the elbows. This helps to immobilize limbs to prevent the pulling of tubes or IV lines. Vinyl-faced foam can be wiped clean with disinfectant. Available in 9", 11", 13". The Torso Belt wraps around the patient and the back of the wheelchair or Geri-chair to help keep the patient from sliding forward and to keep the patient upright in the chair. The Torso Belt's fastener may be positioned in front of patient, allowing for "self-release" or in back of chair for assisted release. Made of thick foam for comfort and quality. 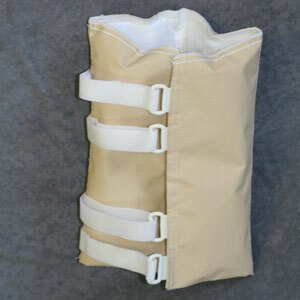 Foam Elbow Splint easily attaches using hook and loop straps. 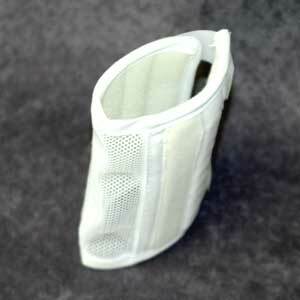 The elbow splint uses plastic stays to prevent bending of the elbows. This helps to immobilize limbs to prevent the pulling of tubes or IV lines. Mesh insert allows for visual inspection of IV site. Double-faced foam for comfort. Availabe in 4", 5", 7". 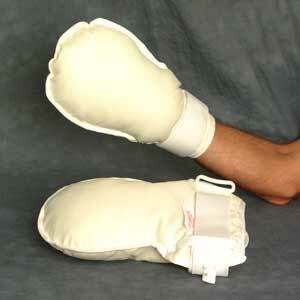 Our Non-Restrictive Closed Mitts will help control the patient's hands, to not interfere with medical treatment. Optional tie-down straps may be secured to the moveable part of bed frame for limiting patient's range of motion when required. Our Easy-Look Mitt will help control the patient's hands, to not interfere with medical treatment. Flap at top of mitt allows circulation to be checked w/o removal of mitt.Optional tie-down straps may be utilized for limiting patient's range of motion when required. 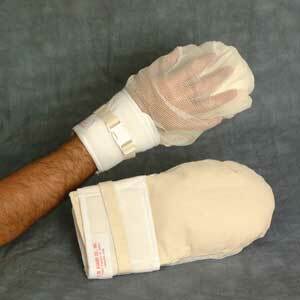 Our Quick-Release Finger Control Mitt will help control the patient's hands, to not interfere with medical treatment. Utilizing "Quick Release buckle instead of lacing or pressure sensitive closure.